In her third season, a South Portland junior finally makes the cut. CAPE ELIZABETH — Saturday was a long day of swimming at Richards Pool, with 10 schools competing in the morning’s South Southwesterns and eight in the evening at the North Southwesterns. A 14-year-old state record fell, thanks to Cape Elizabeth freshman Emily Ecker’s 500-yard freestyle performance of 4 minutes, 58.95 seconds. Waynflete senior Kiera MacWhinnie won two morning events – 100 free and 100 back – and was named South Performer of the Meet. Teamwise, the girls of Cape Elizabeth and Kennebunk ran away with their respective titles. One of the best moments of the day came in the slowest of the four heats of the 200 freestyle at the North meet. It was the first individual race and came on the heels of Cape Elizabeth breaking a meet record in the 200 medley relay. 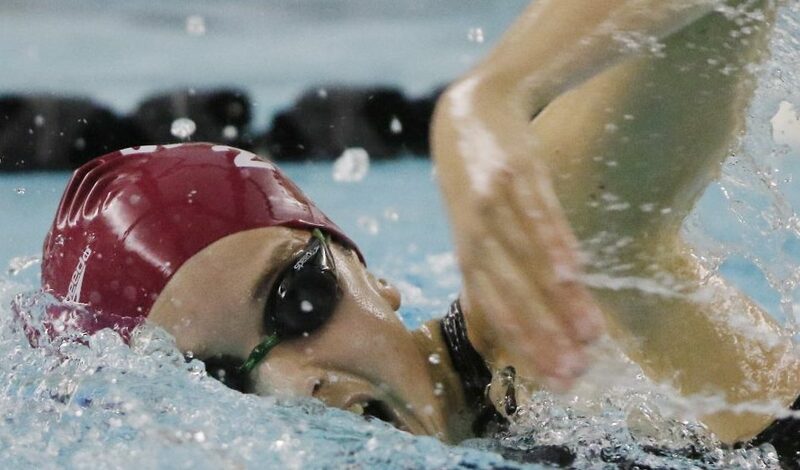 In the middle of the pool, Scarborough senior Jillian Schell and South Portland junior Ashley Clark were neck-and-neck for the lead and the capacity crowd noticed, growing ever louder as the two girls churned through eight lengths and seven flip-turns. But they weren’t simply racing each other. The qualification standard for the state meet is 2:30. Clark’s best time was 2:33.80. She had not managed to qualify as a freshman or a sophomore. Saturday was her last chance of the season. A late surge propelled Clark into the lead. She touched the wall at 2:29.35, looked up at the clock, then slapped her hands on the water in delight. 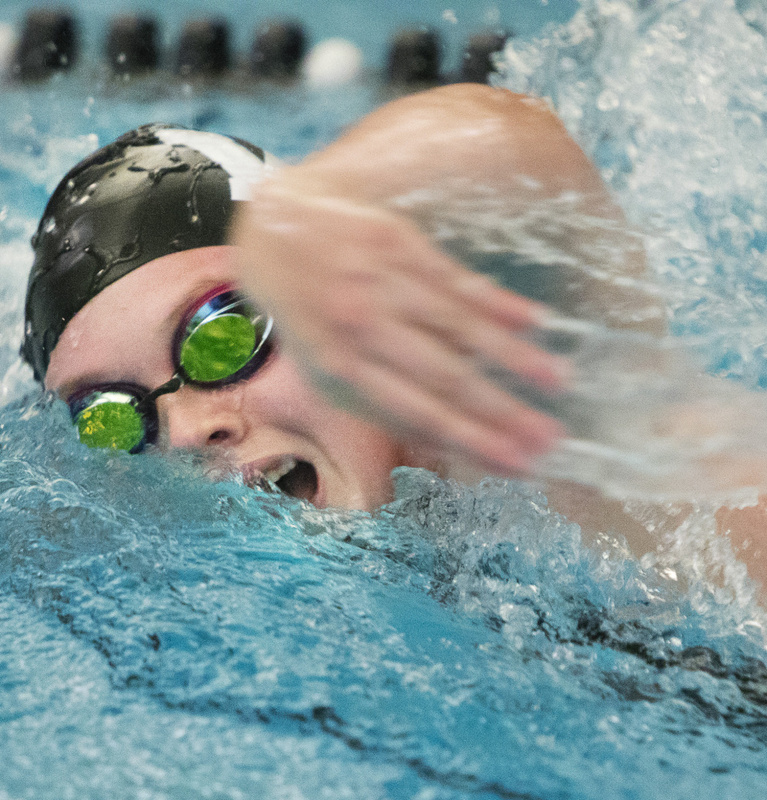 Because she dropped four seconds from her previous best time, Clark will swim in the Class A state meet Tuesday at Bowdoin College’s Greason Pool. She will be seeded 45th of 50 girls entered in the 200 free. Schell’s story is equally noteworthy. She was timed in 2:29.83 and will be the 50th seed – making the states as a senior for the first time, and she’s been trying for four years. Neither Clark nor Schell is likely to place among the top 16 and score, but that’s not the point. To see the look of joy and triumph on the faces of Clark and Green was to understand the true meaning and purpose of high school athletics. Championship week kicks off Saturday with the Class B boys at the University of Maine. Ellsworth is the defending champion and coming off a close runner-up finish to Old Town in the league meet. Meanwhile, Cape Elizabeth edged Cheverus for the South Southwesterns title, so expect a three-way battle at the state meet between Ellsworth, Old Town and Cape Elizabeth. In the Class B girls’ meet Monday in Orono, it’s hard to imagine any school coming close to Cape Elizabeth, which completely dominated the South Southwesterns. Then again, Morse High of Bath was nearly as dominant in the KVAC championships earlier this month. The Shipbuilders will be ready to pounce if Cape Elizabeth stumbles. Class A gets under way Monday at Bowdoin with Cheverus seeking a fifth consecutive boys’ title. Stags senior Shane Moore will be tough to beat, but depth could be an issue. Brunswick and Bangor will be in the hunt as well, and don’t discount Thornton Academy, the South Southwesterns champion. In the Class A girls’ meet Tuesday, Brunswick is the two-time defending champion and in senior Caitlin Tycz has the state’s best swimmer, but graduation took a big bite out of the Dragons’ depth. That leaves Cheverus, Brunswick, Bangor and Cony of Augusta, bidding for the first swimming state title in school history. Brunswick edged Cony by 10 points in the KVAC meet, but Cony won two of the three relays and all but one of the individual swimming events that didn’t involve Tycz.